Apple cider is a true seasonal treat. 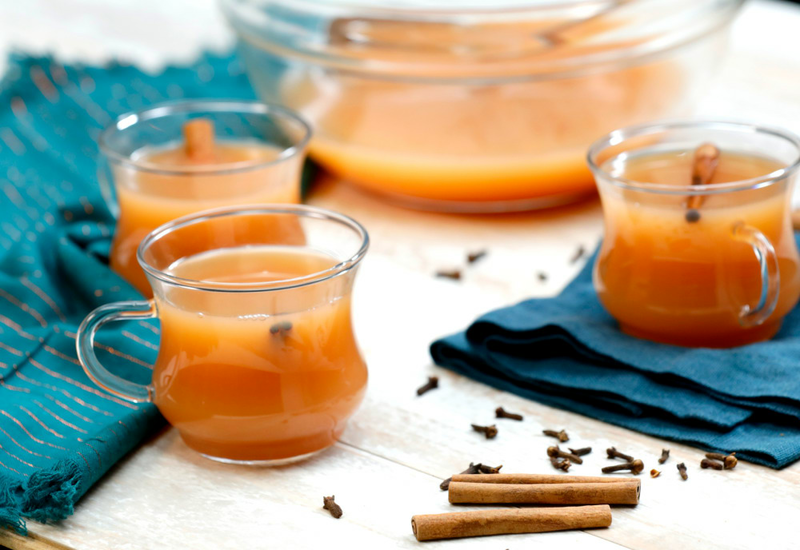 Warm, mulled apple cider is even better. Use your pressure cooker and blender to turn fresh apples into delightful mugs of spiced apple cider that go well with or without the added shot of bourbon. Your home will be filled with the aroma of Autumn in just about 40 minutes! Garnish each serving with additional cinnamon sticks for perfect presentation. Working in batches, blend apples, apple juice, and lemon juice in a blender until smooth; strain through a fine-mesh strainer directly into the pot of a pressure cooker. Pressing solids with the back of a spoon to extract as much liquid as possible. Discard pulp. Alternately, blend the ingredients in a large bowl using an immersion blender. Strain cider through fine-mesh strainer, catching the whole spices and any other sediment. Discard solids. If you wish to turn this into a warm, winter nightcap, pour a shot of bourbon into the bottom of your mug and top with the cider. Try replacing half the apples with pears for a pear-apple cider! To easily peel fresh ginger, you can actually use a spoon. Hold the ginger root in one hand and the bowl of a metal spoon in the other. Scrape the edge of the spoon against the ginger to peel off the skin. Per Serving: 233 calories; 1g fat; 60.5g carbohydrates; 1g protein; 0mg cholesterol; 15mg sodium. Had never thought to try making my own cider until seeing this recipe. Growing up, fall and cider went hand-in-hand. That Michigan tradition doesn't seem to translate the same in the Pacific Northwest. You can find cider, of course, but it's not ubiquitous, nor are there cider mills for annual pilgrimage. All of this is a shame because they grow apples out here like mad! Anyhow, this turned out quite well. Even mulled some of it, which may or may not have ended up with rum in it. This apple cider was fabulous, and it was especially delicious spiked with a little bourbon. If you're looking for the perfect holiday drink, this is it! I will be drinking this into the new year! I've always loved apple cider, and there's nothing else like it when it's made fresh. This recipe is quick and delicious. If you like cider drinks, you must try this. The pear-apple blend is also amazing! It wouldn't be apple cider without the bourbon! My high speed blender blended the apple and juice mixture perfectly. I've only made cider one other time before and it took all day. So excited i can achieve the exact same results but with much less time in the pressure cooker. I used gala apples for a less tart taste, and it was absolutely perfect. This was such an easy recipe to make in my MultiPot. Normally I would spend hours making this in a slow cooker, and then still have to mash the apples. This method is much simpler.